Thanks to a $1.5 million grant from the W.K. 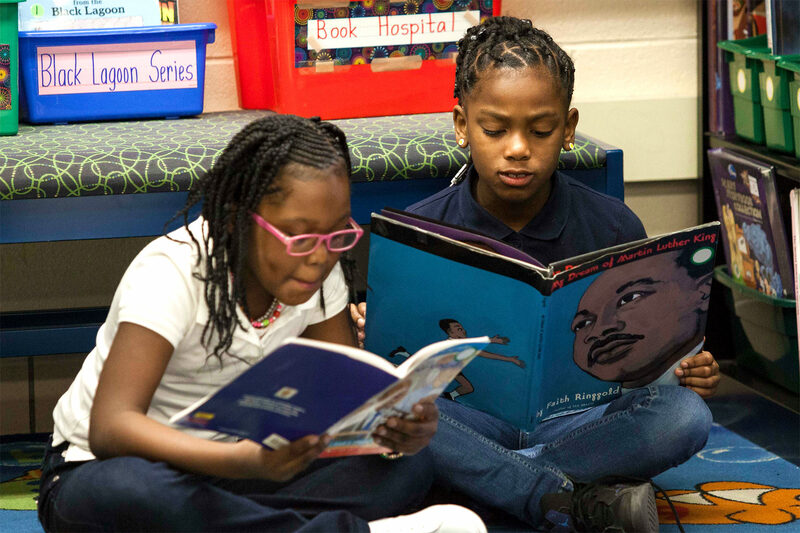 Kellogg Foundation, Children’s Literacy Initiative has begun a multi-year, transformative project to help children attending under-resourced, high-need elementary schools on Chicago’s South Side, by providing content-focused teacher coaching, evidence-based trainings, and books and materials. Children’s Literacy Initiative (CLI), a 501(c)(3) non-profit organization working to improve early literacy instruction, has initiated a multi-year, transformative project to help children attending under-resourced, high-need elementary schools on Chicago’s South Side reach their full potential. The three-year project, kicked off in five schools in October 2018, is funded by a $1.5 million grant from the W.K. Kellogg Foundation of Battle Creek, Michigan. This project will serve kindergarten through second grade classrooms in Burnham Elementary Inclusive Academy, Mildred I. Lavizzo Elementary School, Mount Vernon Elementary School, Ralph H. Metcalfe Community Academy and Wendell Smith Elementary School. These elementary schools are all in Chicago Public Schools (CPS) Network 13, which services the South Deering, Roseland, West Pullman and Washington Heights neighborhoods. Working with 27 CPS teachers, CLI will employ its proven model of content-focused teacher coaching and evidence-based trainings. CLI offers both one-on-one and small group coaching, including demonstrations and feedback to help teachers incorporate effective literacy practices into their daily work with students. CLI trainings give teachers the chance to learn best practices, observe video demonstrations and engage with each other. CLI will also share and disseminate teaching tools from its catalog of diverse books and educational materials, which are already circulating in other high-need CPS elementary schools across the city, and spurring increased student engagement and positive results. Results of the Partnership for Assessment of Readiness for College and Careers (PARCC) third grade English achievement test showed that schools in CPS Network 5 receiving CLI services performed better on average and grew at a faster rate (from 23.5% proficient to 25% proficient) than similar CPS schools not served by CLI (from 20.5% to 20.3% proficient) between academic years 2015-16 and 2016-17. CLI book collections contain books that are both windows into the world and mirrors that students can see themselves in. In curating its book collections, CLI brings a very intentional approach to selecting quality titles written by authors from diverse cultures, who tell stories that are culturally representative of the children reading them. CLI’s bilingual and Spanish-language books are authentic texts, written in Spanish, not simply books translated from English, such as De aquí y de allá by Maya Hanisch. Book collections in classrooms with predominately African-American students include African-American main characters, such as Of Thee I Sing by Barack Obama. Established in 1988, Children’s Literacy Initiative (CLI) is a national 501(c)(3) non-profit organization, headquartered in Philadelphia, that is focused on improving literacy instruction in public, charter and parochial schools to ensure that students can read on grade level. CLI’s program provides personalized coaching for teachers and principals, research-based literacy training and the books and materials classrooms need so that students can become powerful readers, writers and thinkers. Third-party research has shown that the CLI professional development model can improve both educators’ early literacy instruction and also student reading achievement. Connect with CLI on Twitter @CLIupdates, on Facebook at Facebook.com/ChildrensLiteracyInitiative and via https://www.cli.org. The W.K. Kellogg Foundation (WKKF), founded in 1930 as an independent, private foundation by breakfast cereal pioneer, Will Keith Kellogg, is among the largest philanthropic foundations in the United States. Guided by the belief that all children should have an equal opportunity to thrive, WKKF works with communities to create conditions for vulnerable children so they can realize their full potential in school, work and life. The Kellogg Foundation is based in Battle Creek, Michigan, and works throughout the United States and internationally, as well as with sovereign tribes. Special emphasis is paid to priority places where there are high concentrations of poverty and where children face significant barriers to success. WKKF priority places in the U.S. are in Michigan, Mississippi, New Mexico and New Orleans; and internationally, are in Mexico and Haiti. For more information, visit http://www.wkkf.org.